The Hosa Technology Tracklink Guitar to USB Interface lets you plug your guitar directly into your computer. 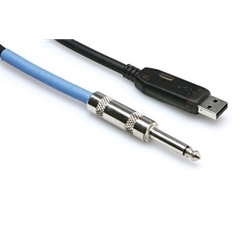 One end is a standard 1/4" guitar jack and the other end is a USB connector with a built-in A/D converter that turns your analog guitar signal into 16-bit, 48 kHz digital audio. Easy setup, just plug the cable between your guitar's output and the computer's USB port and you're ready to go. If you use stompboxes or other effects, simply connect the Tracklink cable between the output of the last effect in your signal chain and the computer. The unit also works great with basses, keyboards, and any other electronic instrument that outputs to a mono phone jack.